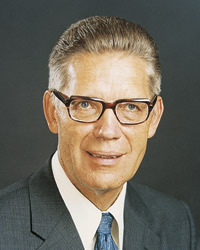 April 19, 2015, marks exactly 30 years since Bruce R. McConkie, of the Quorum of the 12 Apostles of the Church of Jesus Christ of Latter-day Saints died. I realize that he said some pretty controversial stuff. I know that he insulted people who believe in evolution, I know that he compared people who leave the LDS Church to barking dogs, I know that he eviscerated Eugene England and George Pace. Those are valid issues and can be discussed elsewhere. I will ignore any attack comments that show up. I feel, and the Spirit seems to accord, that the most important doctrine I can declare, and the most powerful testimony I can bear, is of the atoning sacrifice of the Lord Jesus Christ. Finally, on a hill called Calvary … the Roman soldiers laid him upon the cross. Then the heavens grew black. … There was a mighty storm, as though the very God of Nature was in agony. This was always my grandmother’s favorite talk. She always said that it was the most powerful testimony she ever heard. I may not be a total fan, but ready the copies my grandmother typed up for each of her grandkids, (mmine was on purple paper) shaped my testimony in ways that allow me to stay as a believe with doubts, covered by the atonement of Christ. In some ways, this talk, the Articles of Faith, and the song I Walk By Faith are what got me through a very difficult time as a teenager. Age and approaching deather seems to make us all a little softer, kinder, and closer to the spirit and the truth.